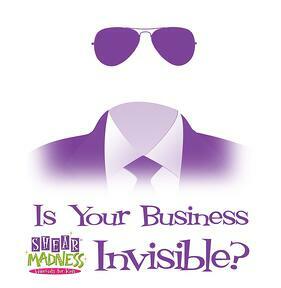 Is Your Business Invisible to Customers? It's a mystery! As a business owner, you just can't figure it out. You have a great location in a high traffic area, and you have a great store with a product or service that you KNOW the people of your community need or would love. However, you just aren't getting people to come through your door. What do you do? 1. We didn't recognize the brand: Even though the store was one we passed by every day, we didn't recognize the sign of the store and unfortunately had nothing to pull us into the store. Take for instance "Hobby Lobby" or "Michaels". The logo is instantly recognizable, and when you see the sign - you more than likely know what's inside. True, these are national brands that have a huge amount of marketing dollars behind them in order to build brand recognition But smaller brands who may not have those expansive resources can still work on getting the brand out to the immediate community through flyers, advertising in local papers, advertising at local sporting events, parades, guerrilla marketing efforts, etc. 2. The exterior of the store was bland: Don't get me wrong, the exterior of this particular store is very nice. But there was nothing to actually communicate to us what was inside the store. No posters or window displays to attract our attention and help us understand what was actually waiting inside. Some local stores that we didn't know anything about prior to visiting, actually were able to get us to walk through the door through a cool window display, a banner on the outside advertising what's inside, or some kind of poster in the window showing more about what to expect inside the store. 3. Awareness of Service or Product Costs: Sometimes as a customer, we've decided not to visit a store because we don't really know how much the services or products may cost. It isn't until we look up a menu (for a restaurant) or find a sale advertisement in a local newspaper that we decide to pay the store a visit. For example, I love coffee shops. However, it wasn't until my local "Dunkin Donuts" sent me a flyer in the mail advertising their drinks that I was suddenly made aware that they were even in the community. And seeing that their drinks were comparable to what I was already spending, I was enticed to give them a try. After their effective marketing and great service, I now go there frequently. Do you have a store that needs more customers? Take a look at the exterior from a different viewpoint - use some of the tips above to communicate! Shear Madness Franchising franchises Shear Madness Haircuts for Kids salons. We have worked with franchise stores in providing franchisee support (in order to encourage continual growth and business success), and have sometimes seen the unexpected happen! We provide poster designs (to help communicate who we are), do photo shoots so our franchisees always have content to communicate with their potential customers! We know that most franchise owners may not have opened a business before, having someone who can advise them is a significant advantage of franchise ownership! 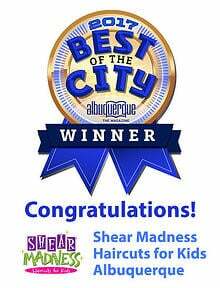 Albuquerque Shear Madness voted Best of City 2017! Some of our readers may recall that the Shear Madness Haircuts for Kids Salon Franchise in Albuquerque was voted Best of the City in 2014, 2015 AND 2016. We are excited to say that they've done it again, and have been voted by readers as Albuquerque The Magazine's Best of the City for 2017! This is quite an honor to be sure, as numerous votes were cast in order to spotlight those businesses, organizations, restaurants, and people that help make Albuquerque such a great place to live! Shear Madness Haircuts for Kids in Albuquerque is noted as not being just another kids' salon, but as a unique place where mounted cars for styling chairs, televisions and Xbox games at every station help make the haircutting experience fun and special. Additionally, Shear Madness also has an award-winning YOUniquey Boutiquey where kids and parents can shop a fantastic selection of toys, jewelry, kids hair products, hair accessories and more. And to top it off, by mixing in ShEAR Dazzled Ear Piercing (a unique ear piercing experience), the La De Da Spa, themed parties, and a great styling staff - customers are sure to find something to bring a smile to their face! Kimberly Abeyta, owner of the Shear Madness Haircuts for Kids in Albuquerque says that, "We are grateful for being voted 'Best of the City Children’s Salon' 4 years in a row! Thank You Albuquerque for making Every Child Matter!" Kimberly also notes how hard the Shear Madness team works to bring smiles to their customer's faces each and every day by building up personal relationships and striving to create a special memory and fun atmosphere for kids and parents alike. Additionally, Shear Madness Haircuts for Kids in Albuquerque has really perfected the art of not only giving a great haircut, but also hosting fabulous kids Birthday parties! For example, the spa party concept has been a real hit in Albuquerque. Girls are treated to wearing spa robes, getting mini manis, twisty updos, glittery makeup, and a glitter tattoo. They sing Karaoke and get to choose a headband from the YOUniquey boutiquey to take home! 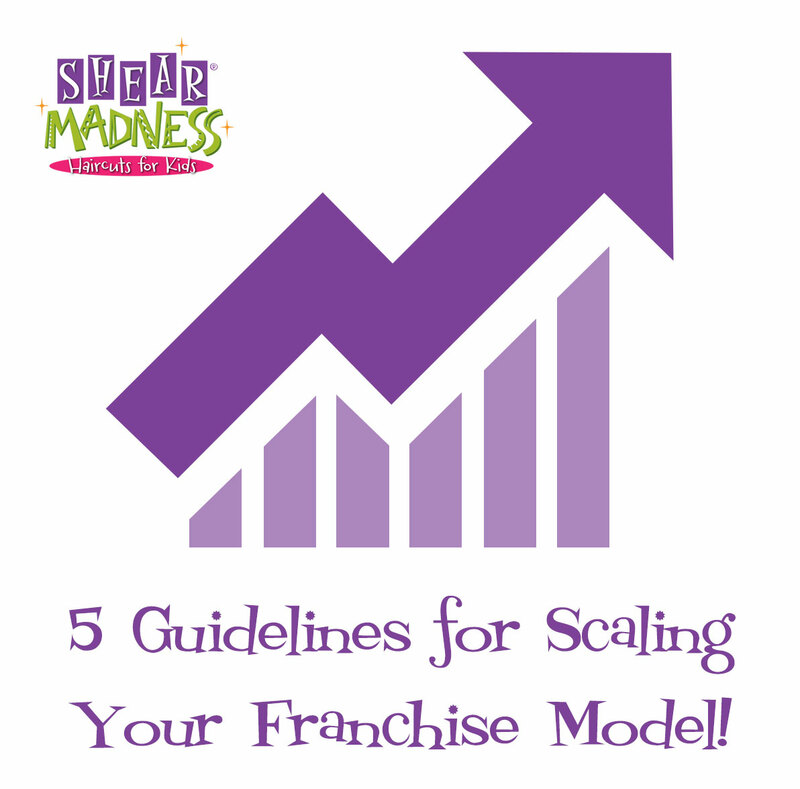 Janon Otto, CEO of Shear Madness Franchising noted that, "Shear Madness in Albuquerque has always been so concerned with excellent customer service since day one! We are so proud of this store, the stylists are excellent, the parties - the best, and now they are doing an excellent job with ear piercing as well! We see this store continuing to build its clientele and remaining - The Best in Albuquerque!" 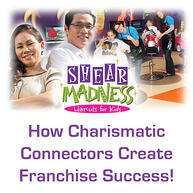 How Charismatic Connectors Create Franchise Success! In previous blogs we have discussed the importance of being able to manage people and create a great team in your franchise. This doesn't happen over night, and depending on the industry you're in it may take months or even years. The key to all this may be your ability to identify the one or two employees who have the ability to lead. Identifying individuals who are the ultimate team players may very well be the key to your business success. A recent Harvard business report calls these individuals "charismatic connectors". These employees will become your Managers and free up your time so that you can work ON your business and not IN your business. They will help save you hundreds of hours of time, and be your wall against you working in your business handling problems. By letting them handle the problems, this helps free you up to work on growing your business. They have the ability to engage any type of personality! Ultimate team players communicate with everyone equally. They don't show favoritism! Every team member has something to offer and these ultimate team players have the ability to bring that out. They show tough love. No one respects anyone that they can run over. These ultimate team players have the ability to put their foot down when necessary, and they can do it in such a way that the others on the team don't show resentment. Instead, they show respect. They lead by example, often working long hours and going the extra mile because they like what they do. Team building is essential in any organization, and building a great team in your franchise business may well depend on identifying those one or tw0 people who can lead others and your business to new heights.